I have to do some learning with these things: I guessed he would need a charm square, but he needed a bit more, so some bits got missed off. I did sacrifice the pink body to get more arms and eyes, but it seems a strange design decisions - can any of you seasoned Sizzixers explain? It does sound strange like it wasn't thought through properly, but your owls are very cute! That was lucky, having the owl fly into your basket! But the cutting does sound strange. Maybe you should phone the manufacturer to make sure you haven't got a faulty die. Do you have other dies that work Benta? The first Sizzix machine I bought was faulty and didn't cut the shapes out properly, although it took me a couple of attempts to realise that. I took it to my local Hobbycraft to get them to check that it wasn't something I was doing wrong. I ended up taking it back to where I had bought it and getting it exchanged for a new one, and I haven't had any problems since. 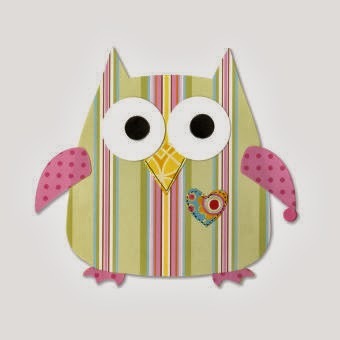 Can't help with your Sizzix problem, but the owl sure is cute! Maybe its like templates in magazines and if the parts are exactly the same shape they only show them once? Bit of a pain having to roll through another smaller bit of fabric, though. Bizarre! HAve you looked at the die 'instructions' on the website? I have no ide what's going on with missing body parts, but the owls are really cute! Good luck.